Once in a while I use marbles in a floral arrangement. I drag out a round glass bowl from the miscellany cupboard, plop a brightly blooming plant inside (usually a primrose), and carefully pour in marbles around the pot (inside the glass bowl) until the pot disappears from view and only the marbles are visible below the blooms. I did this a couple of weeks ago, but last night I realized the plant was looking terrible, so . . . end of centerpiece! 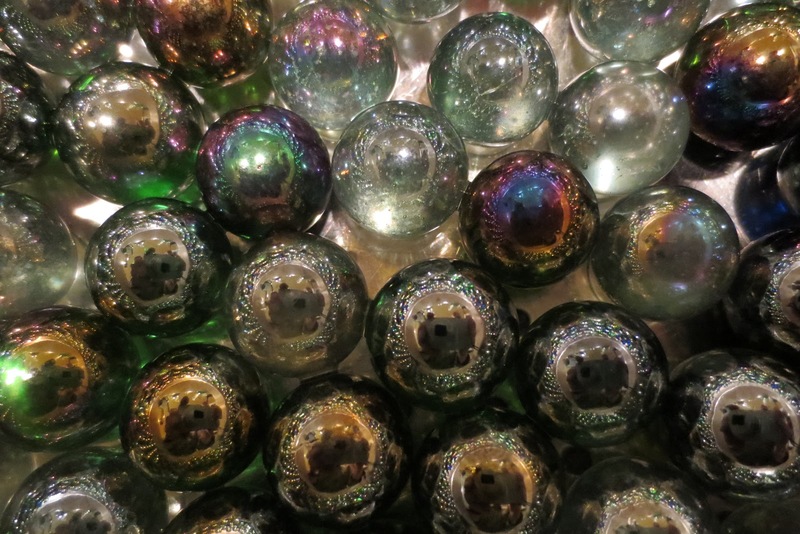 Today was put-the-marbles-away day. 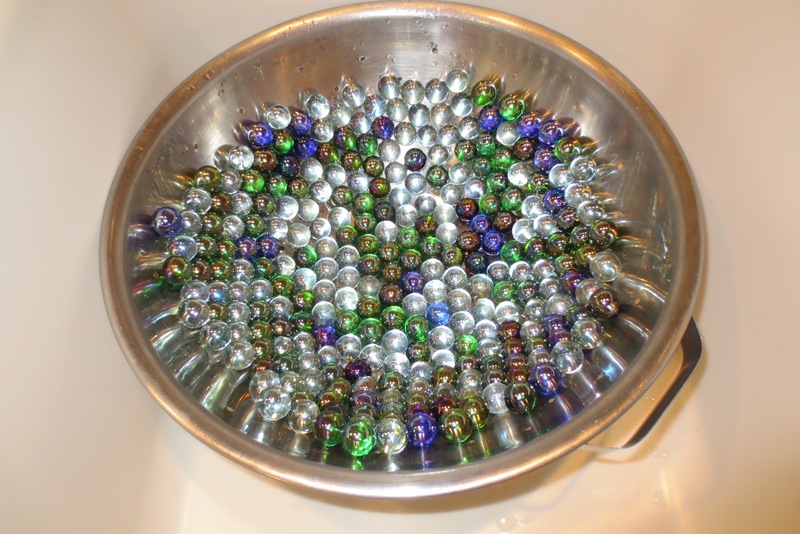 It’s always a bit of a drag because the marbles get wet in the bowl and need to be dried thoroughly. I rinsed them in a colander and set them aside to dry. 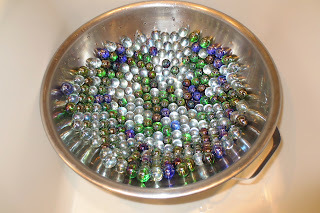 While they were sitting on the counter thus, I pushed my hand into the center of the marbles and discovered they could be pushed up the sides of the colander until they were all in one layer. A law of physics at work . . . and rather thrilling to impress Hubby with my discovery. I took the picture with my newish camera, a Christmas gift from one of my sons. It’s a Canon PowerShot Elph 320 about the size of a tin of Altoids. Inspired by the camera’s reputation for automatic micro-focusing, I took a close-up . . . and what to my wondering eyes should appear, but eight little camera lenses looking back at me. Being alive in a time where a camera like this one is affordable enough for ordinary people to own makes me hope I never lose my marbles! When is the last time a theatre piece moved you to tears? Hubby tells me I’m a pushover when it comes to emoting in the audience. And yes, I’ve had quite a bit of experience weeping in the theatre during the past half-century of play going. I am the perfect audience member in some ways, as I am instantly drawn into the story—although if the production is seriously flawed, I can be brutally critical. But give me a good script that’s reasonably well staged by an insightful director with a talented, disciplined cast, and I’m an empathic sucker. Sometimes I have to cover my mouth to keep from audibly crying, so as not to disturb other audience members. In 1959 in NYC I did sob out loud, almost uncontrollably, at the plight of J.B. as I sat watching Archibald MacLeish’s play by the same name. Listening to the recording of the play with its original cast, Raymond Massey, Christopher Plummer, and Nan Martin, still makes me weep. But at the time I saw it live, I was nineteen years old, overcome by the devastating power of poetry in the hands of professional actors. Now I am going to admit publicly that only a couple of days ago I wept over the performance of puppets. Perhaps you are conjuring up the image of little Punch-and-Judy type hand puppets, but in this case, we’re talking HUGE. Puppets so big that they each have three operators. 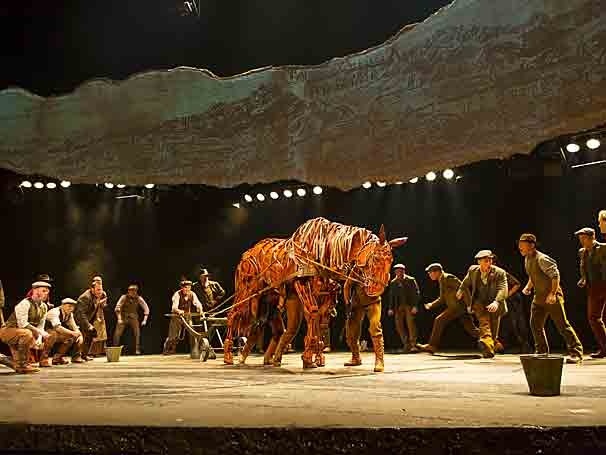 If you’ve already seen War Horse on Broadway or on tour, this won’t come as a surprise. Only the hardest of hearts could be unmoved by the beautifully distilled story. I am NOT talking about the movie, however. I'm talking only about the play. The production I saw in Seattle, co-sponsored by The Seattle Rep and Seattle Theatre Group, was truly magnificent—the essence of what a good theatre piece be. The sparse set was eloquent in its minimalism; the actors were talented; the script was well written. But it was puppet-masters— with their nuance, their tight choreography, their perfect timing that made it extraordinary. And the message—that war is utterly devastating—is exceptionally powerful in this conveyance. If your town is hosting the National Tour of War Horse and you can get tickets reasonably (I have a feeling the scalpers are making a killing on this one), try to see it. It’s a superb piece of theatre. When Hubby looked in the fridge for lunch ideas today, he loudly proclaimed, "Oh,oh . 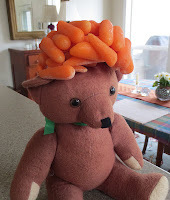 . . carrots look like they're frozen." 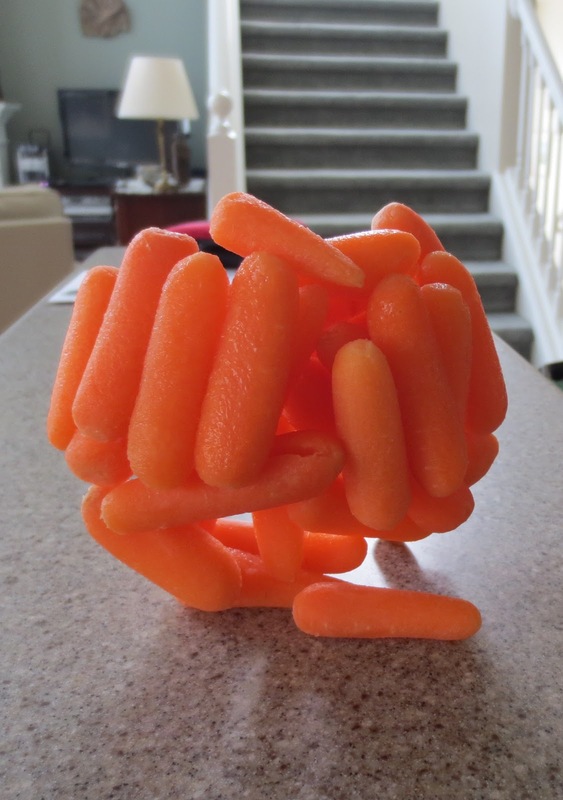 And sure enough, upon closer inspection, the bowl of carrots remaining from our tiny "Superbowl party" (my sister and brother-in-law joined us for a game-and-gab-fest yesterday) had frozen solid. "Time to turn up the thermostat on the fridge!," I announced, as Hubby dumped the carrots upside down on the counter. They held their shape. "Looks like an Orphan Annie wig," he said. I had an idea and ran upstairs (well, plodded, if you have to know) to select a teddy bear from my small remaining collection. I picked Bubba, one of the earliest members of my teddy bear club. Bubba is hard bodied (not soft and huggable), but he makes the cut for his serious but quirky expression. I took him downstairs. So, meet Bubba. Is he auditioning for Annie? Or is he pantomiming the feelings of the San Francisco 49-er players the day-after? You'll have to agree he brings new meaning to the description, carrot-top, as well as Super Bowl!